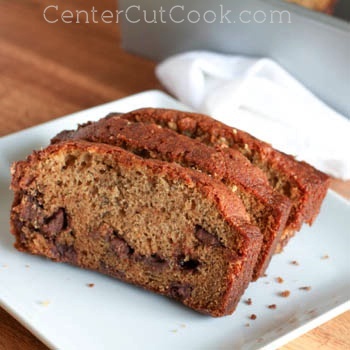 Classic banana bread gets taken up a notch with the addition of chocolate chips! Chocolate Chip Banana Bread is sure to be a hit! Ahhh…. the day of love is here! Hopefully you have somebody or something special in your life to celebrate Valentine’s Day with. Today is supposed to be all about heart shaped cookies, pancakes, and pizzas, and here I am posting banana bread! There’s a reason…. I’m posting this lovely banana bread recipe in memory of my Momma. She used to make a mean loaf of banana bread and today, it has been exactly one month since she suddenly passed away in her sleep. When I was growing up, my mom went out of her way to make sure that the holidays were special in our house. Even the “little” holidays like Valentine’s Day and St. Patricks Day got special attention. She’d decorate the house from top to bottom for every.single.holiday. and always made sure to do something fun so that they were memorable. Now that I’m an adult, I realize what effort it must have taken her to plan ahead and make sure my siblings and I enjoyed the day and the days leading up to all the holidays. Ahh…what a Mom I was blessed with! PS: Add walnuts if you wish…. I belong to the “nuts ruin breads and most desserts” camp, therefore I steer clear of walnuts with this banana bread! Since it’s Valentine’s Day, I’ll leave you with a valentine, from me to you…. I love you ALL more than cupcakes! 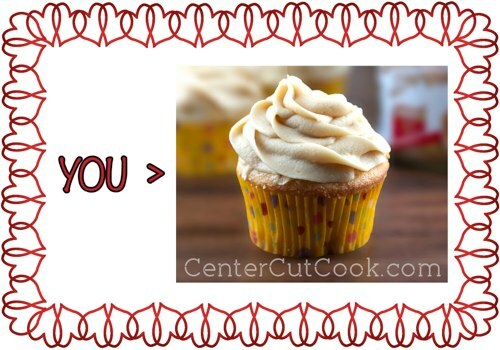 Particularly, I love you more than Biscoff Cream Cheese Frosting (so.good… and shown below). Have a great day everyone! Pre-heat your oven to 350 degrees and prep a loaf pan by spraying it with non-stick cooking spray. In a small bowl, sift together flour, baking soda, cinnamon and salt. With your mixer, beat eggs, brown sugar, and sugar together until light and fluffy, about 3 minutes. Add in vanilla, and slowly drizzle in oil, while mixing on low. Stir in bananas, and sour cream. Combine dry ingredients with the wet and mix until all the ingredients are blended well. Pour mixture in loaf pan and bake for 55 minutes-1 hour, or until the bread is cooked through. Poke the bread with a tooth pick in the center to check for doneness.